Nevada 2016: Rand Paul scores an early victory as lawmakers stick with the caucus. Sorry, Jeb Bush. 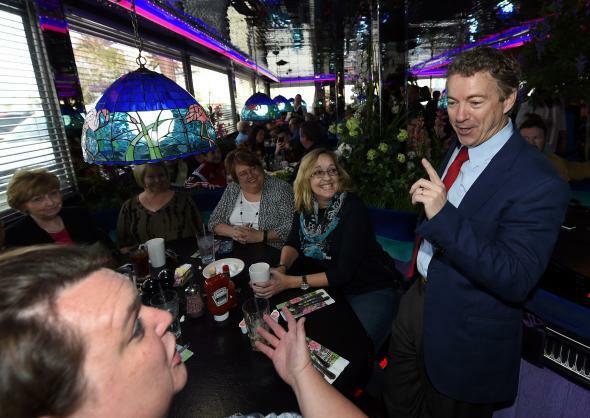 Rand Paul jokes with guests at the Peppermill Restaurant & Fireside Lounge on January 16, 2015 in Las Vegas. Jeb Bush will enter 2016 with plenty of advantages, but the first-in-the-West nominating contest likely won’t be one of them. Nevada lawmakers this week opted against changing the state’s presidential caucus to a primary, a decision that runs counter to the wishes of Bush, Marco Rubio, and other GOP establishment-types who had hoped a switch would give them a better chance at posting a momentum-building victory there. Caucuses require a good deal more effort and patience from voters than primaries, and as a result the contests tend to favor candidates that have built a network of highly motivated activists. That means preserving the caucus is good news for Rand Paul, whose legions of libertarian-leaning supporters are seen as the most likely to turn out in full force next February. It should also give a bit of boost to Mike Huckabee, Ted Cruz, and other candidates who make their living on the edge of the GOP mainstream. When turnout is in the single digits—it was around 8 percent among Nevada Republicans in the 2012 caucus—a few thousand diehards can mean a world of difference. Still, recent history suggests Paul shouldn’t celebrate just yet. Mitt Romney twice coasted to victory in the Nevada caucus, albeit with the help of the state’s large Mormon population, which accounts for roughly a quarter of GOP caucus-goers there. Meanwhile, Paul’s father, Ron, faired relatively well in the past two competitions—but despite locking up nearly 19 percent of the vote the last time around he was still bested by Newt Gingrich for second place on caucus night. The biggest loser, meanwhile, is probably Bush. His friends and allies had reportedly lobbied Nevada lawmakers on his behalf to make the switch to a regular primary. That makes sense given that the former Florida governor could be sweating in early 2016 since two of the first three GOP contests—Iowa and South Carolina—will likely be decided by social conservatives, a demographic that hasn’t quite warmed to him. Still, even if Bush stumbles, his well-funded campaign should have more than enough cash to stay afloat for the next round.